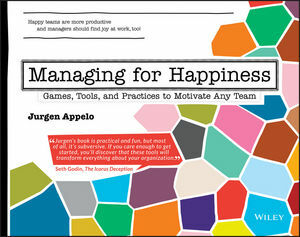 Managing for Happiness offers a complete set of practices for more effective management that makes work fun. Work and fun are not polar opposites; they're two sides of the same coin, and making the workplace a pleasant place to be keeps employees motivated and keeps customers coming back for more. It's not about gimmicks or 'perks' that disrupt productivity; it's about finding the passion that drives your business, and making it contagious. This book provides tools, games, and practices that put joy into work, with practical, real-world guidance for empowering workers and delighting customers. These aren't break time exploits or downtime amusements—they're real solutions for common management problems. Define roles and responsibilities, create meaningful team metrics, and replace performance appraisals with something more useful. An organization's culture rests on the back of management, and this book shows you how to create change for the better. JURGEN APPELO is pioneering management to help creative organizations survive and thrive in the twenty-first century. He is the inventor of Management 3.0 workshops and CEO of the global business network Happy Melly. Inc.com has called him a Top 50 Leadership Expert, a Top 50 Leadership Innovator, and a Top 100 Great Leadership Speaker.